You are here: Home » News » What Is a Slatted Bed Frame? Although slatted bed frames aren't as popular in China as in European countries, they are a unique and simple way to streamline your home furnishings and make your bedroom look clean and uncluttered. 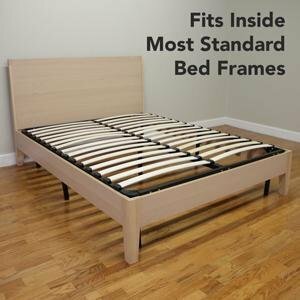 Some platform beds use wooden slats to support your mattress, so lots of the information in this buying guide will be useful if you're looking for a platform bed as well. Standard slatted bed frames are very simple pieces of furniture. They can have as few as twenty or fewer wooden slats inserted between the edges of the frame and a central stabilizing bar, which is usually thicker and sturdier and may be made of metal instead of wood. When it comes to slatted bed frames, the more slats the better. Extra slats will provide better and often even more adjustable levels of support, as well as ensure the bed frame lasts longer. Most slatted bed bases are made of a combination of wood and metal. Slats in a slatted bed frame are made either from solid wood or a layered wood product. They are attached to a rectangular frame which sits inside and flush with the bottom of the frame intended to hold the mattress. Slats run parallel to the head and foot of the bed frame. Beech is a popular material for wooden slats, since it is a fairly stable and long-lasting type of wood. Birch is also used, although it can wear out more quickly.